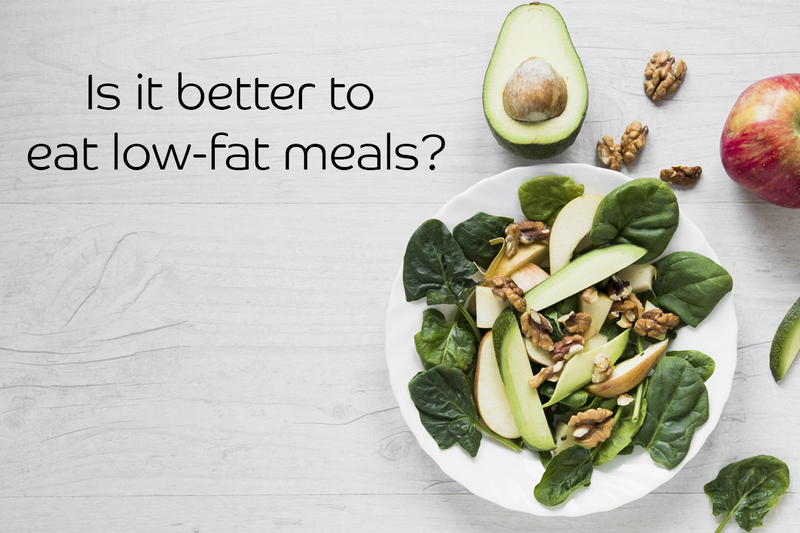 IS IT BETTER TO EAT LOW-FAT MEALS? Do you choose light, non-fat or fat-free products to lose weight? Do you ask for eggs without yolk? Do you remove the skin of the chicken and fish to avoid fat? We all want to have a nice figure! However, the strategy of avoiding fats by consuming fat free, light or non-fat products is causing counterproductive effects on our body. This case might sound familiar to you: someone goes on a low-fat diet and initially loses weight, but then gets stuck – because his/her fat metabolism is affected and his/her body is left unprotected -. Eventually he/she gains the weight back even though he/she is taking more care and exercising more, and never achieves his/her optimal weight. It is an endless race and it is very common nowadays. When you limit the consumption of fats, the one suffering the consequences is your metabolism: it backfires! That’s why you’ll soon find yourself making going on more diets. We have affected the way our body metabolizes fats due to the type of fat we are consuming: Many are not for human consumption! Fats that were not present in our natural habitat are not beneficial for our body, although they are marketed as natural. If our habitat has been nature for millions of years and in the last 50 we chemically produced new food, we are doing an experiment with ourselves. The consequences are reflected in the current health crisis. At the same time we have demonized the fats of truth, those that were in our habitat and in our evolution. In the 1980s, the recommendation to consume low fat foods was generalized; At the same time, the epidemic of obesity and cardiovascular diseases, that we still live, began. Never before had we removed the fats from our diet or consumed so much sugar and highly processed foods. What do we do? Focus on our bodies! Let’s turn the focus inwards: our proposal is to improve metabolism at its core. Having an optimal weight and a good figure are effects of a good metabolism. To have an optimal metabolism we need fats, that’s why we talk about essential fatty acids. The key is in the mitochondria: they are the energy producers of our body and have been evolving for millions of years. And mitochondria only work with the fats that have been present in that evolution. Industrial fats are toxins for our mitochondria, they are what affect the mitochondrial metabolism the most. In contrast, real fats are what give us the cleanest energy for our body. Why are fats so important for my body? • They are the raw material for the membrane of each cell. They are essential for the structure of your body: of your eyes, your skin, your brain. Would you ask an architect to build a house without cement? If your body does not receive fats the integrity of the membrane of each cell is compromised. And it may cause many degenerative diseases, such as autoimmune conditions, allergies or chronic digestive problems. • They constitute 60% of your brain. What would happen if we never changed the oil in a car? The engine would be damaged, surely. When there is no raw material for the brain, probably the consequence is senility, Alzheimer’s, Parkinson’s disease or dementia. • They are the main ingredient for your hormones. Not consuming fats will have consequences in the libido, fertility, menopause, menstrual period and in all hormonal processes. The more the science advances, the more we should love the fat of our body! May fats be your allies! To enjoy a good metabolism – and as a consequence, to have a magnificent figure – do not be afraid of fats! Choose real fats and help your body to metabolize them optimally. This will achieve permanent results, an excellent quality of life and excellent health. To know what the real fats are, I recommend reading this entry: Fats: myths and realities. To have an excellent metabolism of fats and obtain all their benefits, this month we have the Tune Up FIT FAT. It’s ten days focused on optimizing how your body uses fats! ⇐ Do you lower the fever or support it?